Sears is selling hundreds of stores. Investors cheer. Sears is deploying its biggest weapon -- its vast real-estate holdings -- in an attempt to avoid a death spiral. So far investors love it. The core business of Sears (SHLD) is crumbling. Sales have plunged, red ink is mounting and cash is going up in smoke. The once great retailer is a shell of its former self. Things have gotten so bad that Sears plans to raise cash by selling hundreds of its prized stores to a newly formed real estate investment trust, or REIT. Sears said the move would generate "substantial proceeds" and "enhance our liquidity." Wall Street loves the move, instituted by CEO and majority shareholder Eddie Lampert. Sears shares rose as much as 48% Friday. "At the end of the day it was always going to be a real-estate play" by Lampert, said Paula Rosenblum, managing partner at RSR Research. "The fact he's creating a REIT to raise money tells you the business has tanked faster than he thought it would so he's got to play out his end game sooner," she said. Sears expects to distribute shares of the REIT to the retailer's shareholders, giving them potential upside to the new vehicle. A REIT is a security that invests in real estate like shopping malls or skyscrapers. They usually don't pay corporate taxes, but must pay out at least 90% of their income as dividends. The REIT lifeline is just the latest in a series of moves by Sears to liquidate its real-estate holdings to keep the core business alive. Last month, Sears announced plans to shut down 77 Sears and Kmart stores just before Christmas, which in retail is the equivalent to raising a white flag. "We're just watching this slow-motion train wreck. The death of this once-venerable company," said Rosenblum. That wreck only got worse in the past three months. Net losses totaled as much as $630 million last quarter, building on a $497 million loss from the year earlier. Cash on the balance sheet shrank to $330 million, compared with $839 million at the end of the second quarter. "The core business remains horrible," said retail analyst Brian Sozzi, who is CEO of Belus Capital Advisors. Sears pushed back against that characterization. 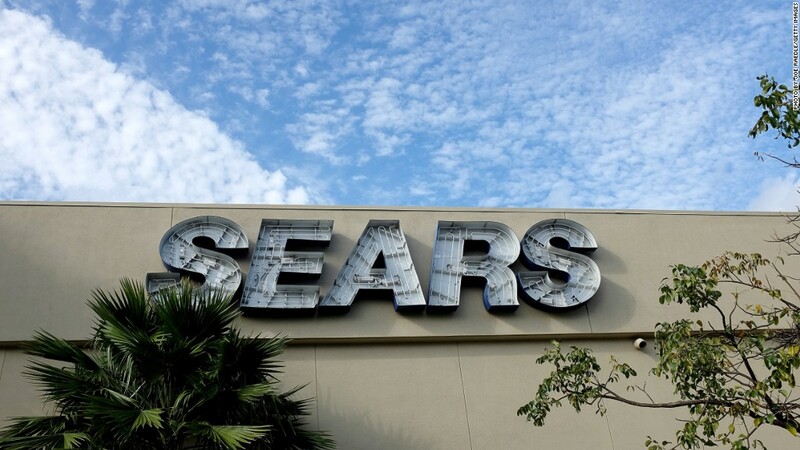 On an adjusted basis, Sears' third quarter losses are expected to be comparable to a year earlier, indicating that its "operating performance has stabilized," company spokesman Chris Brathwaite wrote in an email to CNNMoney. "This represents a meaningful change in the trend of the business," he said, adding that Sears expects this "positive development" to continue into the fourth quarter. And shares of Sears skyrocketed to their best level since December as Wall Street cheered the REIT plan. Sears said it may sell 200 to 300 stores -- likely some of its most valuable ones -- to a REIT. Sears, which cautioned such a move is not a done deal, would lease back the stores and continue operating them. The retailer could then use the cash it generated from the sale to keep funding its business. "This may just postpone the inevitable. Sooner or later they are going to get into this death spiral where they can't sell because vendors won't ship and vendors won't ship because they can't sell," said Rosenblum.